Spoons is a fun card game for three or more players. The more the merrier! It’s simple to learn and can be played by children or adults. There’s even a version of spoons that has become popular as a drinking game at parties. It’s a sneaky game that’s fast-paced and involves bluffing, so if you have a good face for bluffing an opponent, chances are you’ll be good at spoons. A traditional fifty-two card deck of playing cards is needed for the game. Also, an object, ideally a spoon (hey it’s the name of the game after all) is included for each player, minus one spoon. To clarify, if you have six players in a game of spoons, there will be five spoons in play. Players, cards and spoons are all you need and now you’re ready for some sneaky fun. The spoons are placed in the middle of the table, fanned out in a wagon-wheel pattern with the spoon handles pointing outward. Make sure everyone can easily reach the middle of the table to reach for a spoon. Once you have everything set-up, including snacks, it’s time to deal the cards. The dealer shuffles the cards and hands four cards to each player. The game now requires the dealer to take a card, look at it, and decide whether to keep it or pass it to the right. The object is to get four of the same cards (like four aces for example). If he/she does keep it, a card from their current hand is passed instead. The passed card is set in front of the player to the right, and as soon as the card is passed, the dealer can grab a new card from the deck. Like speed, there are no turns! This will continue around the table, each player passing cards (either the one from his/her hand or the one that was passed to them) to their right. The final player (on the dealer’s left) passes his/her cards to a discard pile. Each player can only ever have four cards in their hand. You will see piles of cards stacking up in front of the slower players. The object of the game is to get a spoon. When a player gets four of a kind, they grab a spoon! Everyone else can then reach for a spoon trying to grab one for themselves. Of course, there’s one too few spoons on the table so someone is going to be too slow in grabbing one. The person without a spoon is eliminated from the game. Dealing responsibilities pass to the right after each hand. 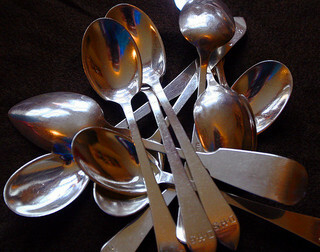 There are variations in the game that allow for a certain amount of eliminations for the slow spoon grabber, including using the letters: S-P-O-O-N. You can also place the spoons in another room to cause complete chaos. Eventually all but two of the players will be out, and it will be a case of being fastest of the two for a winner to be declared. If it is “drinking spoons” the player without the spoon must take a drink.